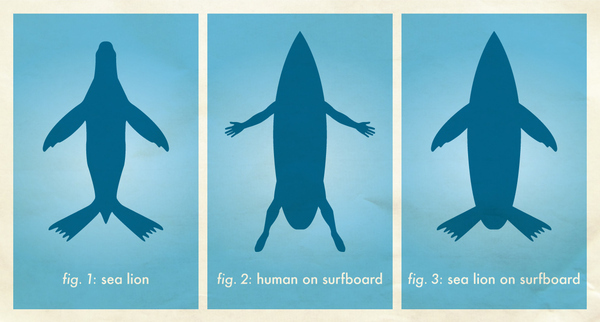 Think about explaining in words: “So you see kids, sharks get confused. They see a surfer and it looks like a seal to them.” Now think about being a little tyke and imagining a surfer and a seal. They don’t look anything alike to you. You wonder if sharks are practically blind or something. Now think about showing them the first graphic. Instant comprehension. The kids don’t even have to think, they just know. This is graphic design at its best. 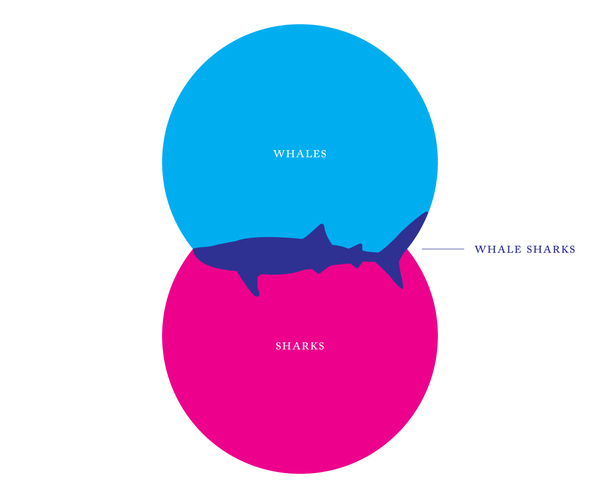 As for the second graphic, man, I think everyone loves some Venn diagrams. Such a powerful way to depict the union of two sets. This one is even better than average so I thought I would share it. I might have run these without captions. Errol Morris had a piece, “Photography as a Weapon” about how much captions can change the meaning of an image and ever since I read it, I’ve been looking at images with and without captions to see if it changes the way I think about them. Morris, Errol. (2008, 11 August) “Photography as a Weapon” [blog entry] New York Times Zoom Blog. Philips, Mason. (2009) Shark graphics for the Discovery Channel’s shark week.